Papyrus is a monster, of course he is going to have a monstrous look! For his physique, Papyrus has a skeleton body. 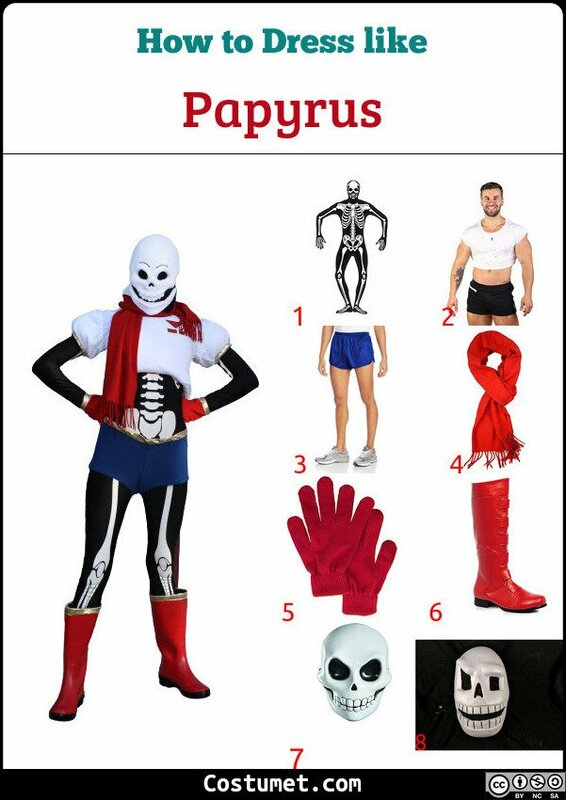 He wears a white crop top, blue shorts, red boots, red gloves, and a red scarf around his neck. If you wish to recreate this look, don't wait! Get to our item list down below right now! 1 Skeleton Skin Suit Get a skeleton skin suit to wear as the first layer of clothes. 2 White Crop Top Put on a white crop top with short sleeves on top of the skin suit. 3 Blue Shorts Pair up your top with a pair of blue shorts. 4 Red Scarf Get a simple red scarf and wrap it around your neck. 5 Red Gloves Put on a pair of red hand gloves. 6 Red Boots Match your outfit with knee-length red boots. 7 White Skull Mask Get a white skull mask to wear as a prop. 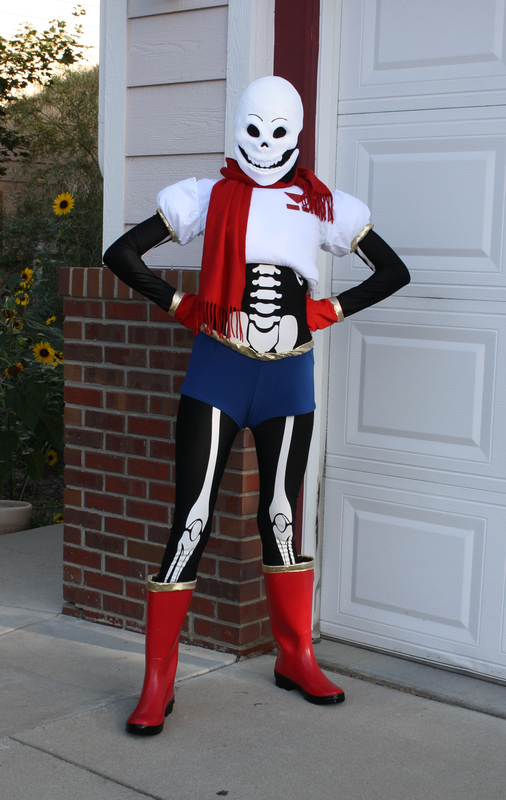 Papyrus is a major character in a 2015 role-playing video game called "Undertale", which is the game about the world of monsters under the surface of the earth after they lost the war against human. Papyrus has a brother named Sans, whom he cares about a lot despite a number of disagreements. Both of them work as a sentry. However, Papyrus' main goal is to become a royal guard, and in order to be so he needs to kill a human. Papyrus is a flamboyant skeleton who is full with confident and charisma, yet optimistic and kind at heart. Sometimes his optimistic plays out as innocence. As a sentry, Papyrus works very hard and can be quite cunning. Skullomania dresses up in a full-body black suit with a white skeleton print on it. He also wears a red scarf around his neck and white boots on his feet.